Tiny House Trailer Review: What's the best tiny home trailer? When I started building my tiny house on wheels in June of 2012, there were no specialized tiny house trailers. I ordered a custom 8x22′ SureTrac Utility trailer from Perfection Motorsports in Richmond Vermont, and took delivery a few weeks later. In this post, I'll compare that experience with two popular tiny house trailers, the Tumbleweed trailer vs. the Tiny Home Builders trailer to figure out what the best tiny home trailer is. I wanted my trailer to be 22′ long, and SureTrac only offered 20′ and 24′ lengths as standard options. There were cheaper brands available from companies like Kaufman and other national trailer manufacturers, but the shipping costs to Vermont always made them come out more expensive. By ordering from a local shop, even though the trailer was still shipped from the mid-west, I did not have to pay those shipping costs. Plus, Perfection Motorsports was able to register the trailer right at their shop and hand me a license plate to drive away with. Bonus! In order to start building on my tiny house trailer, all I had to do was put it up on jacks so that it was level, and remove every other deck board. Since I started building, several companies have started to make tiny house specific trailers. I've received lots of questions from my readers about the pros and cons of these trailers, and what is the best tiny house trailer, so in the rest of this post, I'll take a look at what's out there and offer my opinions. The Tiny Home Builders Trailer was the first tiny house specific trailer that I became aware of, as I think that they beat Tumbleweed to the market. The first thing I can see that's different is that this trailer does not come with a pressure treated deck. In fact, it has no deck at all. As I mentioned above, I removed every other board from my deck and then started framing the floor on top because that is what was recommended at the time. Come to think of it, you could probably skip the decking all together and frame directly on the trailer. Looking at the description, the biggest difference I can see with these trailers that makes them tiny house specific would be the “Minimally Curved Fenders”. As the description says, “Fenders that aren't curved are much easier to cut and trim around which saves you time”. I can definitely see how this would be a benefit. My fenders were very rounded, and I had to spend quite a bit of time building custom wheel well headers to span the wall above the trailer. 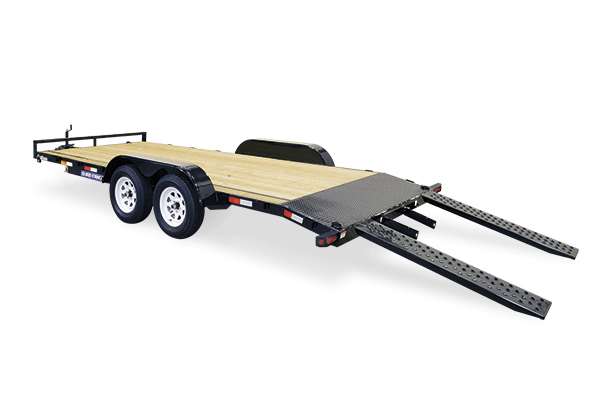 Another feature to note is that the decking is replaced with two long steel channels that run from the front to the back of the trailer, serving as additional attachment points for your floor joists. For the most part, the Tiny Home Builders Trailer looks pretty similar to the trailer that I bought from my local shop, minus the wood decking. You can learn more at http://www.tinyhomebuilders.com/tiny-house-trailers. It did not surprise me when Tumbleweed got into the trailer business. They are already selling lots of plans, shells, and complete homes, so why not round things out by offering a trailer as well? Additionally, I'm seeing that flashing is already installed on the underside of the trailer cross members. This definitely makes building out your subfloor easier, however the Tiny Home Builders trailer page says that this is a problem- that water can get trapped inside the trailer causing rust and rot down the road. I too am wary about accidentally trapping water between the trailer and the subfloor, though I think this could easily be mitigated by drilling a few strategic holes for drainage in the flashing. 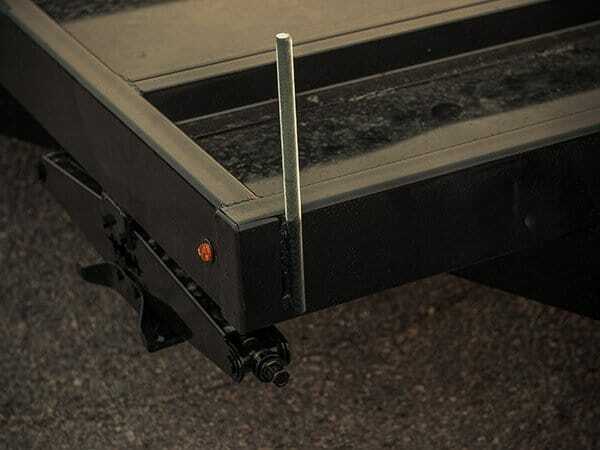 Update: I received the following clarification from Ross Beck of Tumbleweed: The weather flashing on the underside of the trailer frame is designed to leak any moister that may get into the floor insulation areas – the flashing is not welded all the way around on purpose. The new trailer design designs the flashing attached by screws for easy accessibility to plumbing, insulation, etc, and it is also designed to allow any moister to drip out. Tumbleweed essentially does this for you by not adding flashing in certain strategic locations depending on where you're planning to place your porch. I think this is a handy feature as long as you wind up building a porch with the exact dimensions that the trailer allows. This is probably best if you're already building a house from Tumbleweed plans. If you're doing something on your own, you might not like being bound by where Tumbleweed has placed the porch. 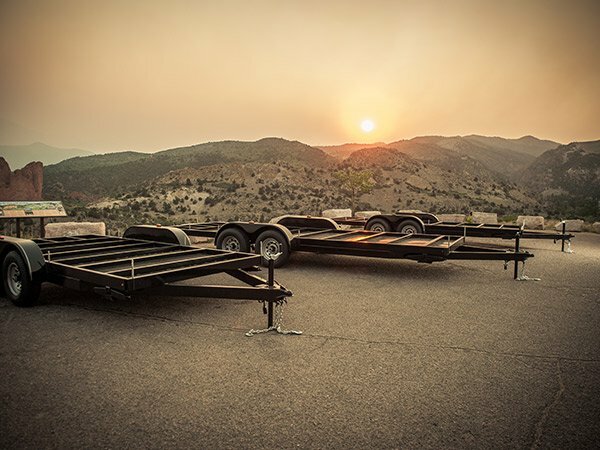 Tumbleweed also offers trailers where the deck is above the wheels rather than between it. This makes for a much simpler build, as you don't have to work around the wheel wheels. On the flip side, a trailer with the deck over the wheels is much taller than a standard utility trailer, so it effectively reduces how high you can build the actual house. Tumbleweed advertises the deck over wheels trailer for their Mica house, which does not have a loft. Again, I've selected the closest comparable trailer to my own, a 20′ flatbed trailer with a full end porch. The price? $4500. However, that's if I'm picking it up. 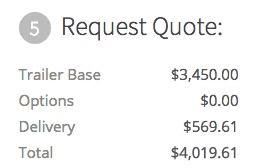 Delivery to Vermont is $1100 extra, which means $5600 total! I like elements of all three options above. The Tumbleweed trailer definitely makes for the fastest and easiest build, but it comes at a steep cost. I think if you live in or near one of the pickup locations (Chambersburg, PA, Colorado Springs, CO, Deland, Fl, or Portland, OR) this one could make sense for you. The Tiny Home Builder's trailer doesn't have a lot of special features, but it is also quite reasonably priced and delivery costs less. In comparing the three options above, I really don't think you can go wrong with any of them. 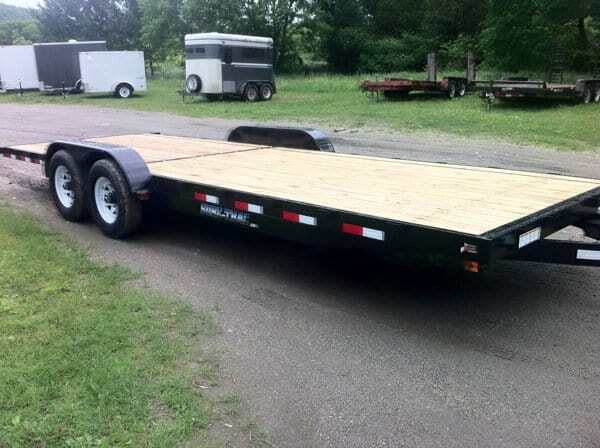 The most important thing in my opinion is that you start off with a trailer that is new or in new condition. The reasons for this are many, and I go into them in detail in my in-depth resource, Tiny House Decisions. I'll just say that your trailer is the foundation of your house, and you'll never be able to change it once you're done building. 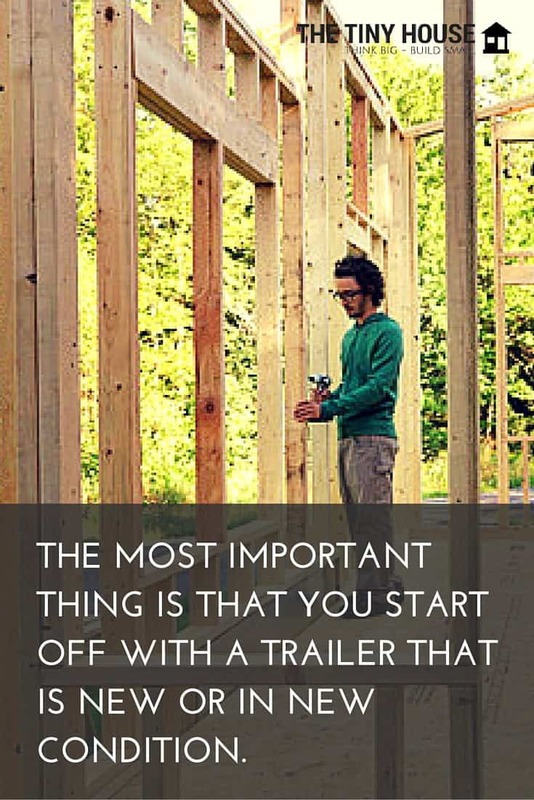 So, start with the best trailer you can afford. Happy building! Did you like this mini-guide? Then you'll love Tiny House Decisions! 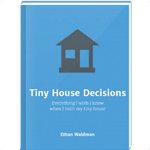 In it, I go through all the major decisions you must make in order to design and build your tiny house, from idea to completion. For each decision, I explain what each option is, what I did (and whether I'm happy with my decision), and make a recommendation. Enjoy!